Baptiste Androuët du Cerceau was appointed architect to the royal buildings. He remained firmly attached to the Reformed Religion. Baptiste was born between 1540 and 1550, probably in Orléans. He was the eldest son of Jacques I Androuët du Cerceau. He was to be present on many construction sites. When a young man, he probably worked on the Louvre construction site, under the architect Pierre Lescot. In 1578, he was appointed architect of all royal buildings. This was an acknowledgement of his renown as an architect and of his excellent professional accomplishments. The same year he was appointed in charge of building the castle of Fresne in Ecquevilly (Yvelines) near Paris. This castle was Henri III’s present to his favourite friend, François the marquis of O. 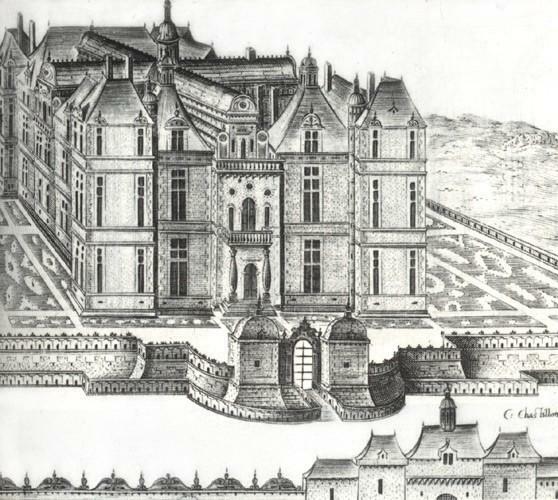 Somewhat later Baptiste became the architect for various rooms in the Louvre Palace and as from 1583 he worked for Marie de Médici on a house situated in Chaillot. He also worked on the hotel de Joyeuse, bought by the king for his favourite friend. Henri III resented his architect’s attachment to the Reformed religion. In spite of such royal resentment, Baptiste remained a faithful Protestant. He died in 1590 and Pierre Birard took his place as architect of the royal buildings.